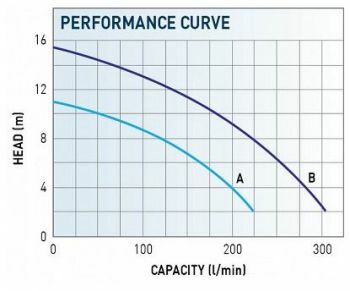 The LB range of submersible drainage pumps are compact, light and powerful. They have a stainless steel casing and a tough Urethane impeller, a double mechanical seal and a water cooled motor, making them ideal for dewatering applications and water features such as water cascades and ornamental streams. They are suitable for ground water and water containing sand and silt with maximum solids handling of 7mm. 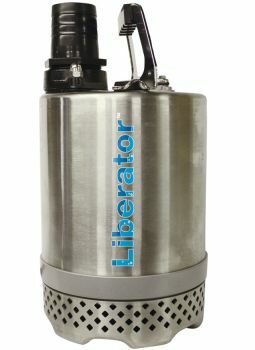 The Liberator LB range of submersible contractor pumps are compact, light and extremely powerful. They include double mechanical seals and have a water cooled motor. They are particularly suitable for ground water removal and water containing sand and silt. They are also excellent as waterfall / watercourse pumping. The 505C is a fully submersible de-watering pump for clean or silty water. It's a robust and sturdy with main components in alumium alloy thereby making this pump ideal for site work in tough conditions. Excellent protection against wear and motor contamination is acheived through a double mechanical seal and oil chamber, separating the motor from the pumped liquid, and a rubber coated suction plate. Discharge connection - hosetail 50mm / 2" 50mm / 2" 80mm / 3"
Recommended discharge hose (int Ø, mm/inch) 50mm / 2" 50mm / 2" 80mm / 3"